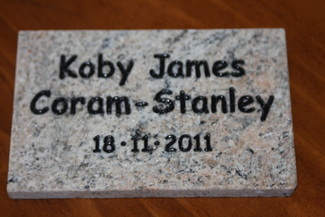 Koby was buried, and we have a headstone that we designed for him. For us it is nice to have 'somewhere'. This is our peaceful place. It really is beautiful out there, I can't imagine ever thinking this before, but now that he is there, it is. 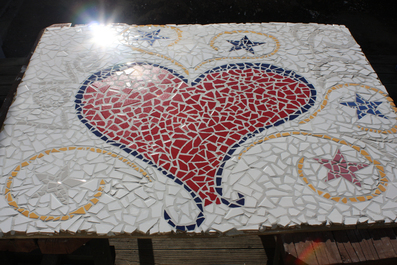 I created this mosaic - and I had never ever done anything like this before - celebrating our family. 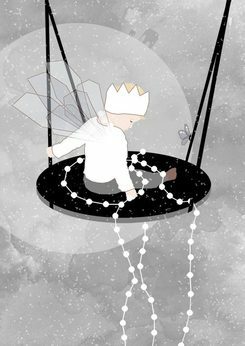 In my grief and with my inability to really think clearly, I made an extra star - the stars represented all our children. 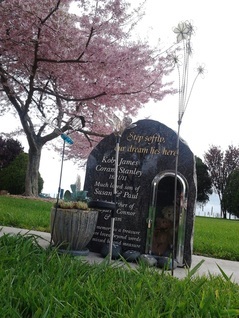 Later of course, I believe this was a sign from Koby - as in this picture there is a rainbow (bottom right corner) the last star was my rainbow baby, who now delights, entertains, and helps to heal us ... and Koby knew and tried to comfort me then with this. 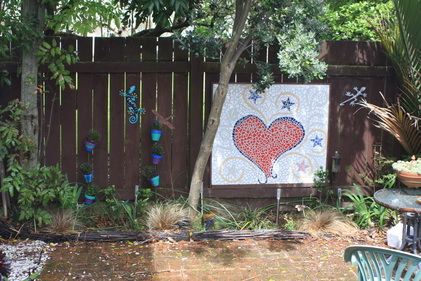 My Mosaic hangs in the garden which I also created for Koby - known as "Kobys Garden", it is also a peaceful place in our home, and while gardening is not a skill of mine it hides treasures and things I have made or found for Koby. 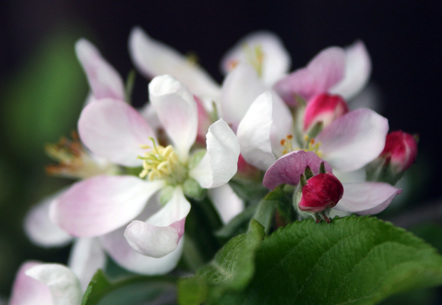 It is currently filled with masses of red flowers. I change the colour of the flowers each year, but am often drawn to purples and blues for him, as this is the colours I associate with him. There are gorgeous blue iris's that flower in pots beside the garden also, which are Kobys flowers, they are from my Mums garden, as she bought them to his funeral. 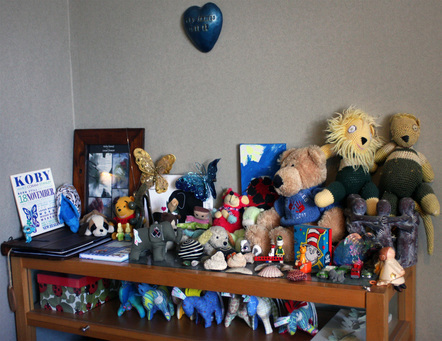 We also have 'Kobys Corner' in our bedroom, filled with toys the kids have given him, matchbox cars, necklaces, prints, photos, everything and anything that we feel belongs to him. The collection grows constantly as we find new things, and each year we also buy him a Christmas decoration which also lives here. I partake in the global event organised by CarlyMarie where I take a photo each day for the month of October, around my grief, and I like to get these printed into books. I have done this for the last 3 years. 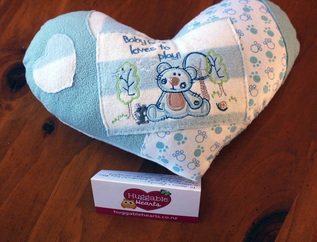 I have this lovely birth keepsake designed for me by Melody at MelodyArt & Design. 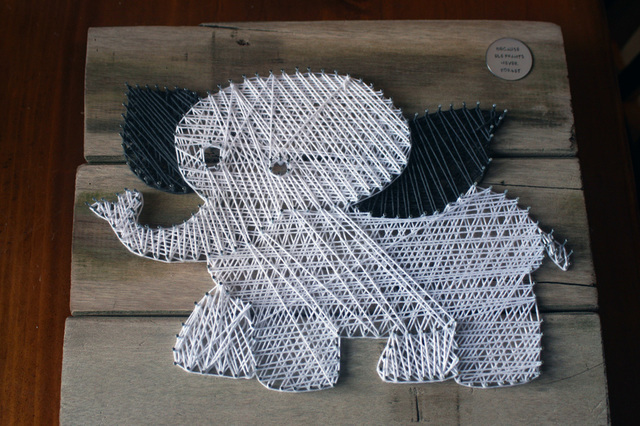 This is a free service she offers for those with angel babies, and she has a million other stunning designs too. In an image above you'll see I have it printed onto a tile ... which was done by Nicky at Nix Dungeon. This gorgeous heart is weighted to Koby's weight (485gr) and was made by Andrea at Huggable Hearts ... another angel Mum who wants to give back. This one is made out of one of Kobys outfits. It is wonderful having something that is his weight - somehow makes him more real. My husband and I have matching tattoo's of Koby's footprints. They are his actual footprints, and mine are actual size... with his name of course. I love that I carry these with me all the time. A gorgeous friend of mine makes these beautiful bears, and a few of my friends had this bear sent to us. A very treasured possession, and amazing for cuddling. My Teddy is the place to go for these. 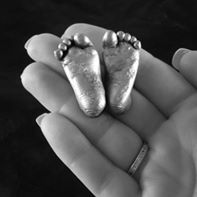 The amazing team at Glover Memorials make these little plaques for angel babies, they are free. 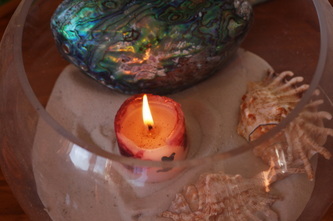 This one sits on our dining table with some other keepsakes. 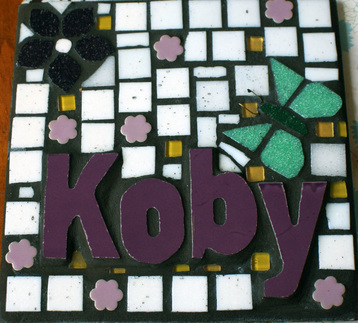 This gorgeous Koby mosaic is another treasure we have recently acquired! 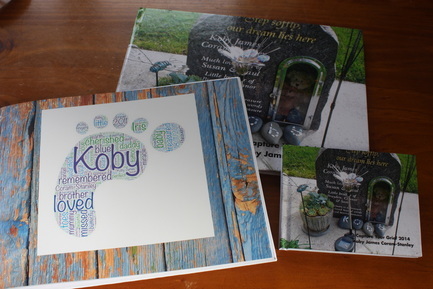 We had a custom print designed by Nikki at The Little Curator - she made this one especially for Koby but has amazing ideas and a unique style so can make something amazing for you if you wanted! Note we have elephants on the moon (Elephants never forget), and a butterfly on the swing ... I can picture him this age sitting on a swing in heaven watching over us. I love it so much. 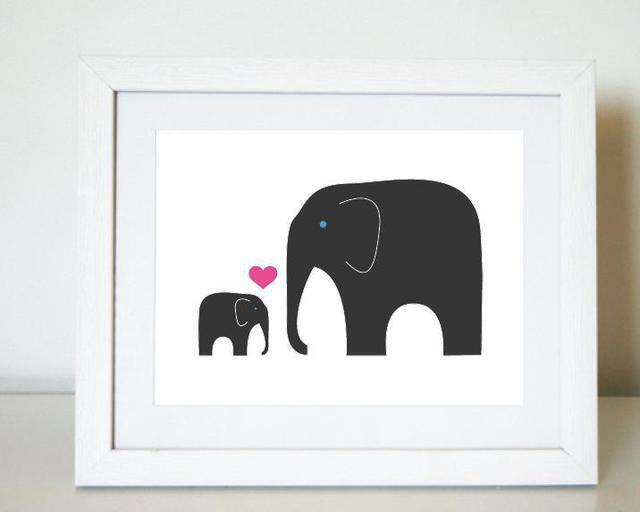 The very first gift we received after losing Koby was a little elephant with a card that said "Elephants never forget". Ever since then Elephants (and butterflies, and iris's have kinda been Kobys 'thing'). I recently had this made by Nadia at Jay and Bee ... she makes amazing nail art and can do pretty much anything! It is on upcycled timber too which makes it extra special. I put a little disc on it myself saying "Because Elephants Never Forget" just cos that is my thing. I like to participate in the International Wave of Light, and light a candle for my baby, and every other baby who is not here on earth. 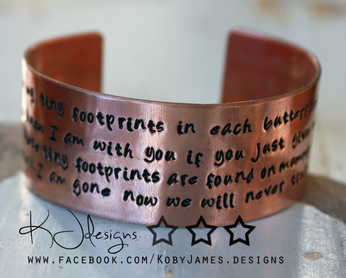 I make myself numerous items of jewellery with quotes, names anything on it. 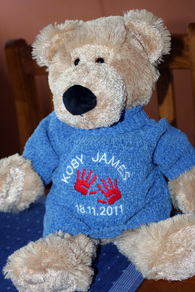 I have bracelets, necklaces and rings in memory of Koby. 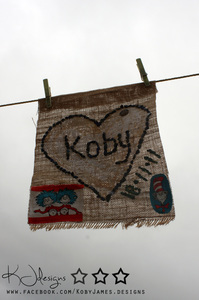 Another global event I took part in last year - making a prayer flag for Koby. This is also organised by CarlyMarie. 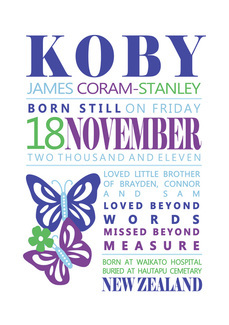 Because of Koby - I can appreciate LIFE more. I appreciate the beauty and (when I have time!) I love to photograph flowers and rain and anything beautiful. 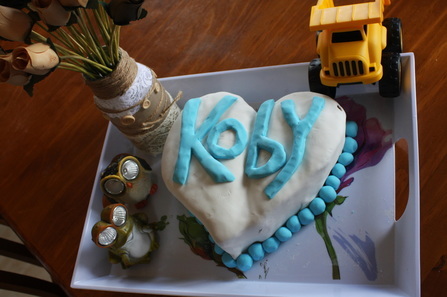 I'm a terrible baker ... but we have a tradition of 'bad' cakes and Koby gets a birthday cake each year just like everyone else. Jen from Angel Casts - does castings of angel babies in the Waikato. This is something I wish beyond anything I had known about, and would be so treasured. There are others throughout NZ who do this amazing service as well. I do not have enough photos. Can you ever have enough photos when you just have a few days to capture them ? When you dont realise how important these photos will be later ? There is not one photo of me and Koby together. I didn't want to be in photos. I wish I could go back in time and have hundreds of photos of me with him. 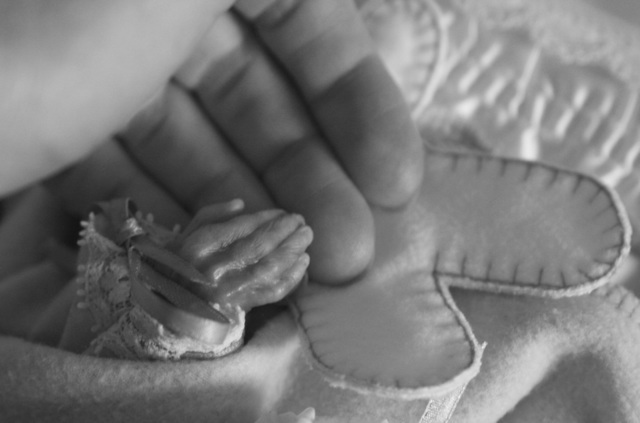 Heartfelt are a group of amazing photographers who offer a free service of creating photographic memories. Again, I wish so much I had heard of them, or at least understood the importance these photos would have as time passed.